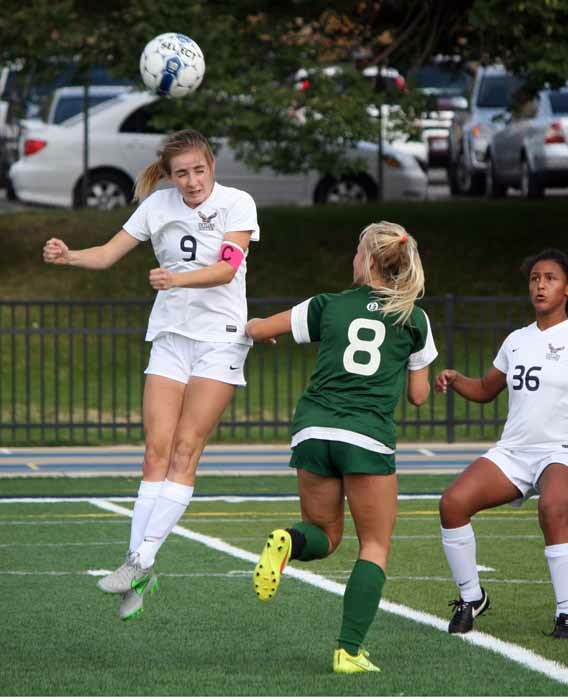 SALT LAKE CITY – The chase for the title in Region 6 girls soccer seems to go through Skyline. 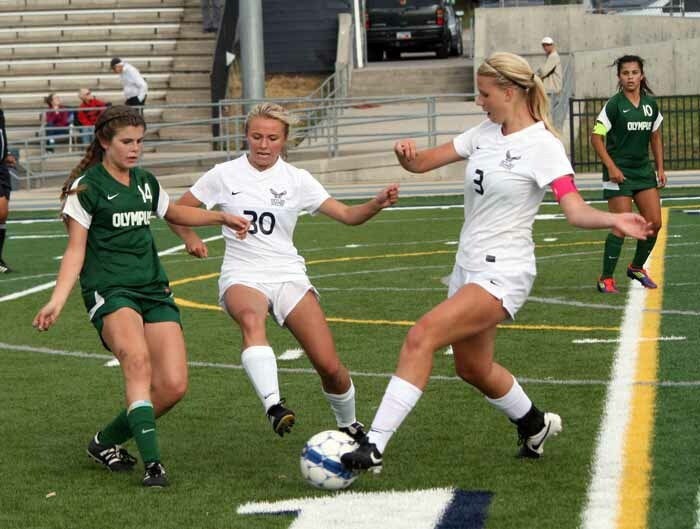 When you consider the Eagles had scored 59 goals and allowed just four through their first 10 games, Olympus faced a big challenge when it arrived at the stadium at Skyline Thursday afternoon. 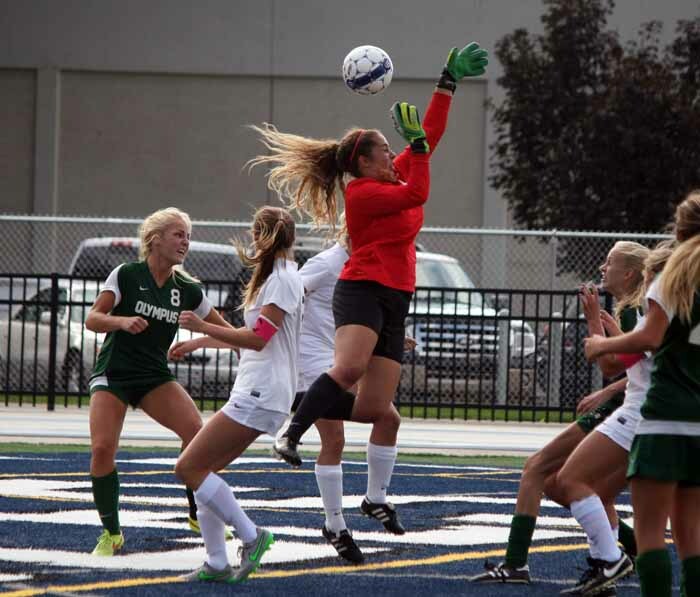 The Titans needed some outstanding work between the posts from goalkeeper Alexia Savas and a tenacious effort from their back line as they held Skyline to just a single second-half goal in earning a 1-1 draw in a critical Region 6 road contest. While the Eagles sit atop the league standings, Olympus is fighting it spot in the postseason bracket and every point is huge. For most of the afternoon, Skyline dominated the ball and played a huge percentage of the game in the Titans’ defensive half of the pitch. But that’s where Savas came up big. The junior goalie did a great job getting a touch on corner kick after corner kick, turning aside dangerous Eagle scoring chances. Then, when Skyline did get a look at the goal, she made a series of outstanding saves that kept it from finding the back of the net. The Eagles really dominated play in the midfield, beginning pretty early in first half, as Bella Sorensen was all over the pitch. Add to that an aggressive mentality from junior defender Maddie Gill, senior Alltse Soto and sophomore midfielder Berger Meyer and you had a ball-hawking mentality that kept the ball going forward. The Eagles created numerous chances for the high-scoring Skyline striker duo – Holly Daugirda and Emma Heyn – to make runs at the goal. There were a significant number of near misses in those shots on goal, and then there was Savas. In the 26th minute, Olympus pushed the ball through the Eagle defense to junior Ashley Cardozo as they countered against the heavy Skyline pressure. Cardozo stayed out in front of the defenders and then chipped Eagle keeper Myah Tatton for the game’s first score. Despite being outplayed on the ball for most of the first half, Olympus went to intermission with that 1-0 lead. Within the back 25 yards of their defensive end, Titan defenders Kristen Stephenson, Sarah Newton, Rilee Mezenen, Mayson Aldous and Regan Crofts really tightened up, staying physical with Daugirda, Heyn, Sorensen and Meyer, and the Eagles found themselves unable to solve Savas. In the second half, Skyline turned up the pressure to an even higher level, and those Titan defenders joined them. That tough defense limited the number of shots on goal for the Eagles even further in the second half, but the pressure was constant and eventually it had to crack, if only for a second. That happened in the 52nd minute, when Meyer volleyed a ball in the direction of Daugirda and the senior directed the ball inside the far post with her left foot for her 19th goal of the season. The equalizer turned out to be the final tally of the contest but only because the defenses were outstanding. Olympus turned aside run after run deep in its end of the field, while Soto, Gill and the Skyline back line did much of its work closer to the center line as the Eagles kept the Titans from getting much of anything deep into the Skyline defensive zone. There was the occasional Olympus counter, but most of the second half possession was with the Eagles. That trend continued when the game headed into the first extra time period, a 10-minute stanza during which the Titans rarely moved the ball more than 15 yards past the center line. That finally changed a little during the second overtime, but neither team was able to find that scoring chance to change the outcome in its direction. Skyline (6-0-1 in Region 6 play, 10-0-1 overall) will be off until Thursday when it visits second-place Murray (5-1, 7-2-1) in a rematch of an earlier contest when the Eagles took a 5-1 decision that is the Spartans only league loss thus far. 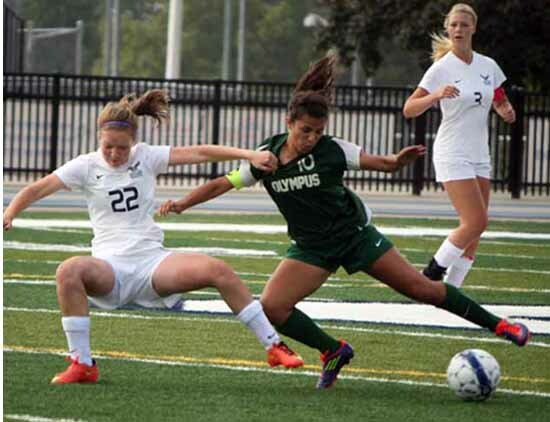 Olympus (3-2-2, 4-4-3) will host Kearns (1-6, 1-8) Tuesday. The Titans currently sit fourth in the region standings, but are just four points out of second place. They beat the Cougars 9-1 earlier this season.